ProjNameGen: There are many like it, but this one is mine. 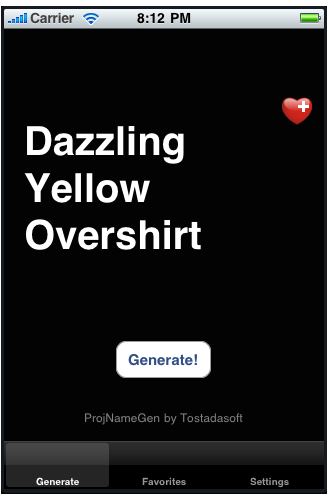 There are tons of random project name generators out there, but surprisingly few for the iPhone from what I can tell. That’s where ProjNameGen comes in. I spent an extremely frustrating but ultimately rewarding weekend bashing my head against my keyboard and threatening to cast off all trappings of technology and join an Amish village somewhere learning about Sqlite, honing my Objective C skills, and navigating the incredibly quirky and unfriendly XCode IDE. The bulk of the app is done. It makes random project names based on word lists for the first second and third words. Right now the first word is always an adjective. The little heart icon in the top right is for marking a project name as a favorite, and I haven’t coded up the functionality for that yet. I’m thinking about making it a simpler icon – white with a punched-out plus sign so it goes with the minimalist feel of the app. The Settings tab will have a few things for the user to play with. You’ll be able to add your own words and enable/disable the first/second/third words. The space at the top will be for advertising. I’m going to document my upcoming struggle to get this thing into the app store.